Home | Unique Summer Adventures with Marin GreenPlay Camp! This summer, sign the kiddos up for a unique summer adventure at Marin GreenPlay Camp! Marin GreenPlay Camp, voted Best Summer Camp in 2017 and 2018 by Marin IJ readers, is an innovative and place-based nature awareness camp for kids entering kindergarten through 12th grade that takes place at locations throughout Marin County. This year, Marin GreenPlay is celebrating its 10th anniversary. 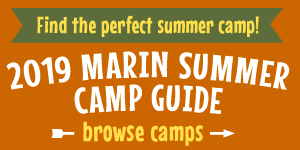 They're also the sponsor of our 2019 Marin Summer Camp Guide! For the 2019 season, Marin Greenplay offers a variety of camps that you won't find anywhere else. Their mobile rock-climbing camps for grades 3 to 12—Rock Five Level 1, Rock Five Advanced, and Rock Beyond— are multilevel, state-the-art day and overnight outdoor rock climbing camps—the only camps of their kind in this area—that take the kids to the best climbing destinations in the Bay Area and beyond. How about a camp for both kids and canines? Dog Days, a camp for kids in 3rd grade and up and their dogs, teaches children how to walk their dogs on the trails and much more. In addition, Nature Makers offers nature-inspired jewelry and craft-making and Summer Beats offers nature-inspired digital music composition.